We had a total of 48 players and raised $2,000 for The Gathering Place. As we look forward to the start of the 2015-16 Paddle Season, I would like to address a question that has been asked recently and has been causing some confusion. I have received a number of emails and phone calls asking whether players with no club affiliation may participate in the traditional winter Men’s & Ladies’ Paddle Leagues. The short answer is, no, all players participating in these winter leagues must be affiliated with one of the area clubs that have paddle courts. However, I think it’s important to give you a more thorough explanation of why this is required. First, please remember that the GCPTA (Greater Cleveland Platform Tennis Association) owns no paddle courts. Our role is to promote and develop the growth of platform tennis through programming that benefits players at every level. We partner with area clubs to grow the game by promoting clinics, leagues and tournaments. Our relationship with area clubs is paramount in allowing us to fulfill our mission. We see the growth of paddle as important to clubs in order for them to maintain and attract members. The Summer Paddle League, which has been very successful in introducing new players to the game, has enjoyed an agreement that our area clubs that allows for participation by individuals that have no club affiliation. 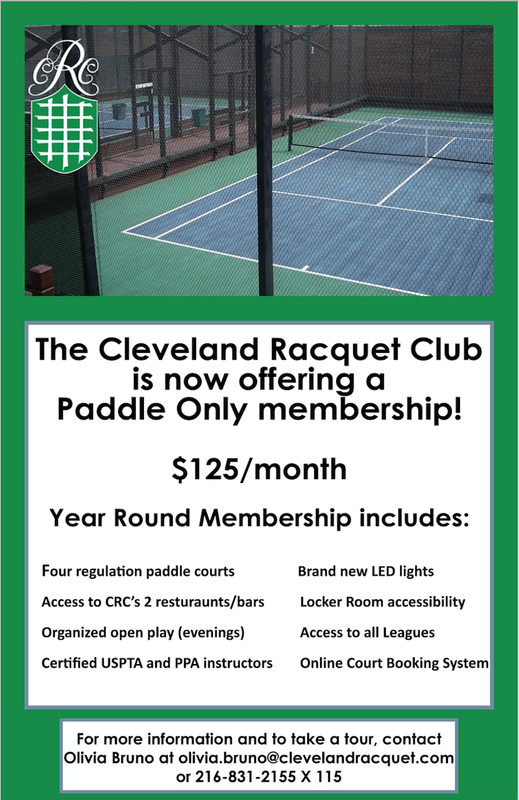 This has been allowed for two primary reasons: paddle courts were traditionally underutilized during the summer months, thus risking little or no displacement of member play, and, because Clubs viewed this “introductory” program as a good marketing tool to expose new players to both the sport of paddle and their club. Currently non affiliated members pay an additional fee to SPL, which is used to host happy hours at hosting clubs, thus giving back to our host sites. Our clubs are all accepting members and will survive by maintaining a strong membership base that can financially sustain their operations. Operating paddle courts is not an inexpensive proposition. Well kept courts are resurfaced approximately every 3 years at a cost of over $2,000 each, wire panels are replaced as needed each year at a cost of approximately $600 perpanel, boards need to be periodically tightened, lights at many locations need to be updated and improved. Lighting improvements can range from several thousand dollars per court up to $10,000 per court. These structural upkeep costs don’t include the cost to operate lights and heaters during the winter months. In short, allowing non members to play year round paddle at a nominal extra charge is not a sustainable business model. The membership at each club absorbs these costs, making it understandable that clubs are unwilling to open play to non affiliated members. We currently have two local clubs that offer a “Paddle Only” membership (both Wembley & CVAC). Many of our other local clubs have very discounted dues levels for individuals under age 30, and even under age 35. I encourage anyone not currently affiliated with a club to use the CLEPDL website to find a home club. It’s a financial investment in your physical and social health. Stay active and engaged…and paddle on! A BIG THANK YOU to all the paddlers who participated in the 2015 Wembley Paddle Camp!!! It was a great success thanks to all of your support. See you next year! On Saturday, August 1st, the Greater Cleveland Platform Tennis Association (GCPTA), or better known as CLEPDL, hosted it’s first Summer Junior Tournament. A small, but enthusiastic group of boys rolled out of bed early to play some fun paddle on a beautiful summer morning. The format evolved into a round robin tournament, mixing ages at times, but all competitors had an entertaining morning of paddle. Our participants included: George Brown, Sam Brown, JR Leedy, Luke Leedy, Louie Seguin, Billy Seguin, Henry Deering, Charlie Deering, John Deering, Anton Manak & Graham Turner. Special thanks to Chris Klampe and The Country Club for hosting play and to Dave Bebout for all his efforts in organizing, recruiting and directing play! We are excited to say our CLEPDL tech team has been hard at work over the summer implementing a CLEPDL web app to make our members mobile experience more friendly. Next time you visit clevelandpaddle.com from your mobile device you'll notice a whole new streamlined experience. It's now easier to access many of the features you'd most likely need on your mobile phone such as score reporting and viewing recent Cleveland Paddle news. When you first visit clevelandpaddle.com on your mobile device you should see a prompt to "Add to Homescreen". This allows you to put a shortcut on your home screen for quicker access. It's kind of like having our own Cleveland Paddle app. If the prompt does not show up you can manually add to your home screen. Please refer to your specific browser's directions. Also note you can switch from the mobile version to the full desktop version at anytime when viewing on your mobile device by clicking the "X" in the upper right hand corner. We hope you enjoy some of the new improvements! Cleveland Paddle was featured on Kickin it with Kenny on Fox 8. If you missed it you can view the segments by clicking here. Great exposure for Cleveland Paddle and our growing sport. Summer Paddle League Starts May 5th!